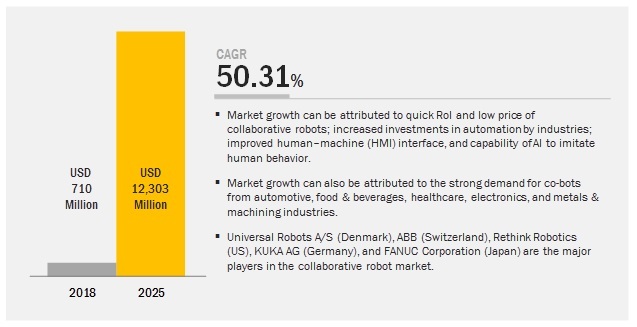 [169 Pages Report] The collaborative robot market is estimated to be valued at USD 12,303 million by 2025, at a CAGR of 50.31% between 2017 and 2025. The study involved 4 major activities in estimating the current size of the collaborative robot market. Exhaustive secondary research has been done to collect information on the market, the peer market, and the parent market. To validate these findings, assumptions, and sizing with industry experts across the value chain through primary research has been the next step. Both top-down and bottom-up approaches have been employed to estimate the complete market size. After that, the market breakdown and data triangulation methods have been used to estimate the market size of segments and subsegments. 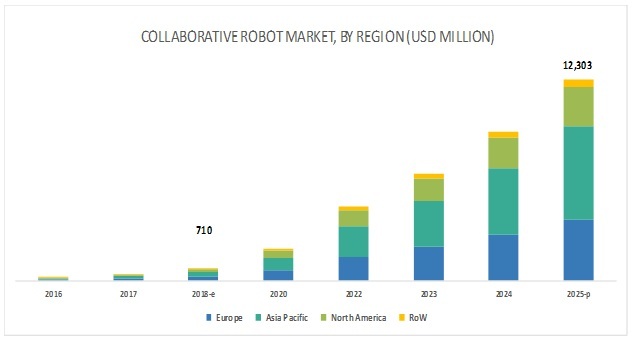 The research methodology used to estimate and forecast the collaborative robot market begins with capturing data on revenues of the key vendors in the market through secondary research. A few secondary sources used in this research include the International Federation of Robotics (IFR), the Robotic Industries Association (RIA), Robotics Business Review (RBR), the European Clearing House for Open Robotics Development (ECHORD), the International Journal of Robotics Research, Tokyo Opensource Robotics Kyokai Association (TORK), EUnited Robotics: the European Robotics Association, Robotiq, the Association for Advancing Automation (A3), and Robohub. The vendor offerings have also been taken into consideration to determine the market segmentation. This entire research methodology includes the study of annual and financial reports of top players, presentations, press releases, journals, paid databases, trade directories, regulatory bodies, and safety standard organizations. 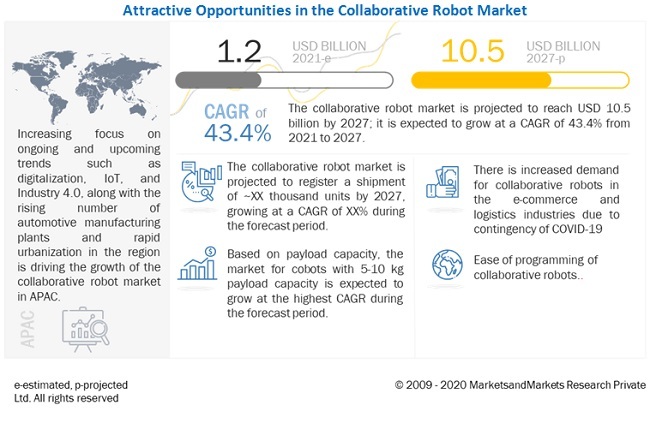 The collaborative robot market comprises several stakeholders, such as original robot designers and suppliers, system integrators, suppliers of standard components, software providers, and original equipment manufacturers (OEMs) in the supply chain. The demand side of this market is characterized by the development of automotive, electronics, metals and machining, plastics and polymers, food & beverages, furniture and equipment, healthcare, and education industries, among others. The supply side is characterized by advancements in payload capacities and diverse applications. Various primary sources from both the supply and demand sides of the market have been interviewed to obtain qualitative and quantitative information. Following is the breakdown of primary respondents. Key players in major industries and markets have been identified through extensive secondary research. After arriving at the overall market size using the market size estimation processes as explained above—the market was split into several segments and subsegments. To complete the overall market engineering process and arrive at the exact statistics of each market segment and subsegment, the data triangulation and market breakdown procedures have been employed, wherever applicable. The data has been triangulated by studying various factors and trends from both the demand and supply sides in the automotive, electronics, metals and machining, plastics and polymers, food & beverages, furniture and equipment, healthcare, and education industries, among many others. This report categorizes the collaborative robot market based on payload capacity, application, industry, and region. The overall collaborative robot market is estimated to grow from USD 710 million in 2018 to USD 12,303 million by 2025, at a compounded annual growth rate (CAGR) of 50.31% during the forecast period. A significant adoption rate of co-bots by small- and mid-sized enterprises (SMEs) across the world because of their recognizable benefits; improved human–machine interface (HMI) and capability of AI to imitate human behavior; and one-stop solution for the safe working environment are driving the growth of the collaborative robot market. Co-bots with up to 5 kg payload capacity held the largest market size in 2017, and a similar trend is expected to continue from 2018 to 2025. The growth of the market is mainly driven by the increasing demand for light, as well as moderate payload capacity of co-bots owing to their ease of deployment, high adaptability, affordability, and plug-and-play characteristics, which are a few essential parameters that meet the demands of a large pool of SMEs. The automotive industry accounted for the largest share of the collaborative robot market in 2017. Co-bots are used to perform diversified assembly tasks across the automotive industry. These robots are also used to perform other crucial tasks in the automotive production line such as pick and place, quality inspection, packaging and palletizing, machine tending, and material handling while offering a safe working environment. The market for assembly is expected to grow at the highest rate during the forecast period. Collaborative robots find their applications in the manufacturing industry as these robots allow the new user to grasp the basics of working easily. Collaborative robots are known for reducing the time of assembly due to their accuracy, speed, reach, and any material handling capacity. Benefits offered by collaborative robots include greater precision than that of special-purpose instruments. They can be easily deployed and sometimes need only reprogramming to resume working on another assembly line. Automotive, food & beverages, and furniture and equipment industries have a high demand for co-bots for assembly applications. In 2017, Europe accounted for the largest market share, closely followed by APAC and North America. The growth of the European market was driven by the strong government support to promote the use of factory automation solutions, thus supporting the adoption of Industry 4.0. However, the market in APAC is expected to surpass the European market by 2025. This growth can be attributed to the increasing demand for collaborative robots in China, Japan, and South Korea, especially for industries such as electronics, automotive, and metals and machining. A few major companies in the collaborative robot market are Universal Robots A/S (Denmark), Rethink Robotics (US), ABB (Switzerland), KUKA AG (Germany), FANUC Corporation (Japan), Robert Bosch GmbH (Germany), MRK-Systeme GmbH (Germany), Precise Automation, Inc. (US), Energid Technologies Corporation (US), F&P Robotics AG (Switzerland), MABI AG (Switzerland), Techman Robot by Quanta Storage, Inc. (Taiwan), Franka Emika GmbH (Germany), AUBO Robotics Inc. (US), YASKAWA Electric Corporation (Japan), Comau S.p.A. (Italy), and KAWADA Robotics Corp. (Japan). In June 2018, Universal Robots and ABB partnered with Kawasaki to develop a common interface for co-bots for offering a simplified human–robot interface with intuitive, smartphone-like navigation, and icons. In June 2018, ABB expanded its product portfolio of collaborative robots with the launch of single-arm YuMi collaborative robot IRB 14050. In May 2018, with investments of more than JPY 17 billion (~USD 150 million), FANUC expanded its production capacity with the construction of 3 factories at its headquarters in Japan. Q1. How big is the opportunity for OEMs of collaborative robots (Co-bots) within smart manufacturing? How would adoption of machine vision technology and integration of artificial intelligence (AI) in co-bots help OEMs to optimize manufacturing processes and generate new revenue pockets in the next 8 years? Q2. Which are the top use cases for co-bot manufacturers where co-bots can be implemented for revenue generation? Q3. Which are the largest end-user industries, and how big are the opportunities for each one of them? Q4. The manufacturing sector in APAC would create a huge demand for Co-bots; who would be your top customers in APAC? What should be your go to market strategy to expand into APAC? Q5. Who are your closest competitors Is it tier 1 companies such as Universal Robots, FANUC, ABB, and KUKA, or do you also face competition from emerging companies such as Yaskawa, Franka Emika, Stäubli, and Techman? 13.3.2 Techman Robot for Quanta Storage Inc.